The number of stocks over their 20-day moving average dropped from 5000 to 3000. Yikes! This is the largest move, in either direction, I have seen since we started collecting the data back in February. Similarly, the number of stocks that closed above their 50-day moving average dropped from 4000 to 3000, another big change. 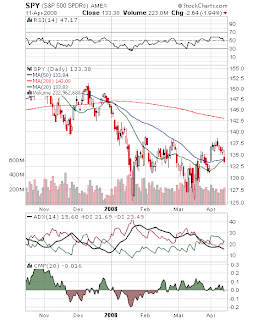 The slower moving indicators managed to continue in the positive direction. Aroon, for example, shows that the number of stocks indicated to be in strong up-trends moved up from about 2400 to 3000. Conversely, the number of stocks indicated to be in strong down-trends stayed essentially flat at a level just under 1000. Interestingly, though statistics for both 20-day and 50-day moving averages deteriorated this week, the number of stocks whose 20-day moving average closed above their 50-day moving average actually increased this week from 2500 to just over 2800. We have added Chaikin Money Flow as an indicator to the chart this week now that we have enough data points to identify whether a trend may be developing. Our scan looks for stocks or ETFs showing reasonably strong accumulation. As can be seen in the chart, the number in that category is still small though it is slowly increasing. So where does this leave us and how does it relate to the major stock indexes? As we did last week, we'll look at the SPDR S&P 500 ETF (SPY) and see if we can draw some conclusions. Last week we pointed out that, with SPY in the neighborhood of $139, breadth had improved quite a bit relative to the last time SPY had moved up into that range. Back in February, breadth was weak, the 50-day moving average provided too much resistance and SPY failed to push through $139 or its 50-day MA. This time SPY pushed on above the 50-day MA but this Friday it fell back and closed below both this important moving average and the $139 resistance level. And in an interesting similarity to our market statistics, SPY's 20-day moving average is almost exactly touching its 50-day moving average. This makes the third time that SPY has failed to push above the $139-$140 range. This resistance level continues to present a real challenge. In addition, SPY has failed to push upward through a downward sloping trend line drawn from the peak at the October high. Other technical concerns related to SPY include a bearish development in the DMI, where -DI just crossed above +DI. Chaikin Money flow has actually turned negative this week, indicating distribution has started. Two weeks ago the economic reports were uniformly bad and the markets held their ground. This past week, there wasn't all that much important economic news but earnings season got off to a bad start with Alcoa (AA), UPS and especially General Electric (GE) taking the entire market down including SPY which lost about 2.7%. To see 2000 stocks fall below their 20-day MA while the S&P loses only 2.7% is definitely disconcerting. So this week, market breadth has deteriorated but is still equal to or better than it has been in weeks. It is alarming, though, to have seen so many stocks fall below their 20-day moving averages so quickly. Apparently, many stocks had been barely hanging in above the 20-day MA and it took just one tough week to push them down below that level again. It also seems to me to be an indication of how skittish investors remain these days. One positive we can point to, however, is the fact that the number of stocks with the 20-day MA above the 50-day MA is increasing. This indicates that strong stocks continue to be rewarded. Many other stocks, however, seem to have merely risen along with the market in general and as soon as the selling began, investors abandoned these stocks. I believe this is what's behind the 2000 stocks that dropped below their 20-day moving averages this week. The sheer size of this number indicates that both weak stocks and mediocre stocks are having trouble finding buyers. So I remain cautiously hopeful. As earnings season progresses we will undoubtedly see offending stocks sold off strongly. If the breadth we have built up so far continues to hold, though, there is a good chance that profitable stocks will hang onto gains. In other words, my expectation is the entire market will not plunge to new lows. Oh, and what about the convergence of all these indicators? A numerical anomaly that indicates we are at a crossroads. But then the market always seems to be at a crossroads lately, doesn't it?